HAVANA (CNS) — At long last, Pope Francis and Russian Orthodox Patriarch Kirill of Moscow embraced, kissing each other three times. “Finally,” the pope told the patriarch Feb. 12 as they met in a lounge at Havana’s Jose Marti International Airport. “We are brothers,” he told the patriarch. Addressing the situation in the Middle East and North Africa, they said that “whole families, villages and cities of our brothers and sisters in Christ are being completely exterminated.” They called on the international community “to act urgently in order to prevent the further expulsion” of Christians, to end violence and terrorism and to ensure that large amounts of humanitarian aid reach the victims of violence. “In raising our voice in defense of persecuted Christians, we wish to express our compassion for the suffering experienced by the faithful of other religious traditions who have also become victims of civil war, chaos and terrorist violence,” they said. They spoke of the need to be vigilant against European integration that is “devoid of respect for religious identities.” They also spoke of extreme poverty, the “millions of migrants and refugees knocking on the doors of wealthy nations” and consumerism. They spoke of life issues: abortion, euthanasia, new reproductive technologies and threats against the churches’ view of marriage. Patriarch Kirill gave Pope Francis a small copy of an icon of Our Lady of Kazan, which itself is a symbol of Vatican-Russian Orthodox detente, but also of failed hopes. The oldest known copy of the icon, an ornate 18th-century piece had been hanging in St. John Paul II’s study for a decade as he hoped to return it to Russia personally. Instead, in 2004, he had Cardinal Walter Kasper take it back to its country of origin as a gesture of goodwill. Pope Francis gave Patriarch Kirill a reliquary with a relic of St. Cyril, the patriarch’s patron saint, and a chalice, which not only is a sign of hopes for full communion between the two churches, but also a sign that the Catholic Church recognizes the validity of the Orthodox sacraments. 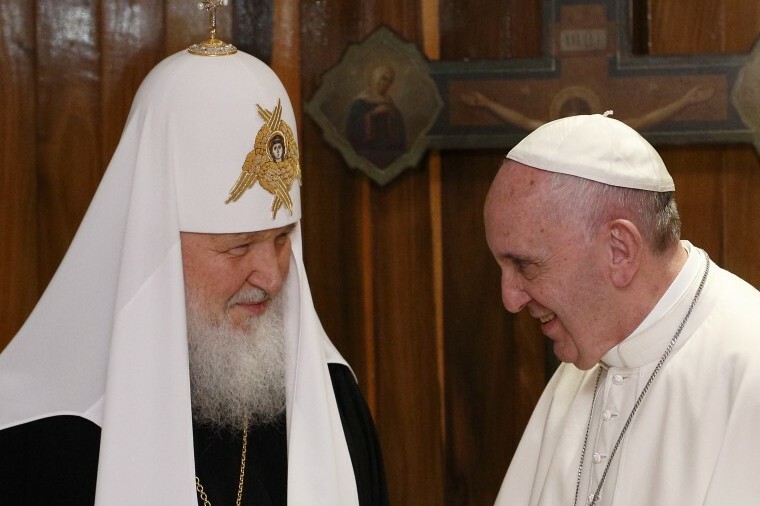 Ukrainians, Catholic or not, have expressed concerns about Pope Francis’ meeting with Patriarch Kirill given the patriarch’s apparently close ties to Russian President Vladimir Putin at a time of ongoing fighting in Eastern Ukraine. Contributing to this story was Junno Arocho in Mexico City.